← Join us for Earth Day 2019! Our 10th Annual Watershed Wide Event was a warm, wonderful day – and our biggest Watershed Wide to date! 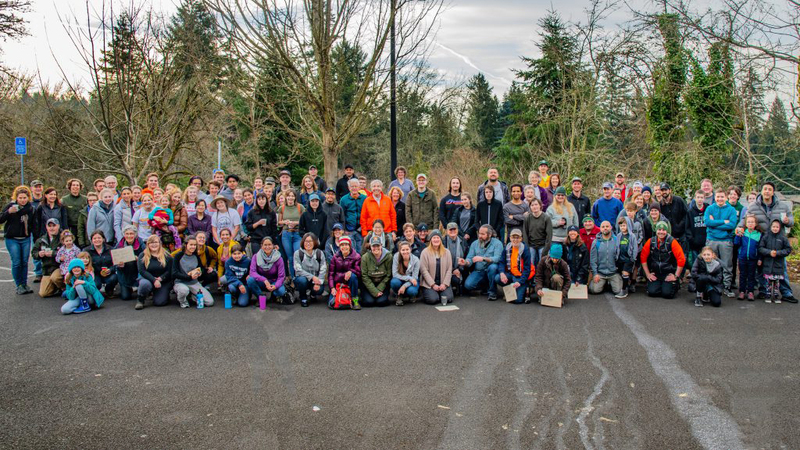 With 155 volunteers (including 40 youth) who planted 565 native plants and removed invasive species from 30,490 sq ft of our natural areas, including ivy from 49 trees, this fun day started with coffee, bagels, and pastries at Riverdale High School. After a few words from TCWC and our partners, volunteers dispersed to six sites throughout the watershed for work parties. We had some great groups of volunteers join us! Youth Charity League; Timbers Army; Lewis & Clark’s Ultimate Frisbee Team, SEED club, and Knights of the Green Table groups; as well as students from several regional schools! Thank you to our partners for hosting work parties and helping to make this day possible: West Multnomah Soil and Water Conservation District, Portland Parks & Recreation, Friends of Tryon Creek, Southwest Neighborhoods Inc.’s Watershed Resource Center, Lewis & Clark College, Lake Oswego United Church of Christ, and the Boonesferry Terrace HOA; and to City of Portland’s Bureau of Environmental Services for funding this event. Thank you also to our indigenous community members for sharing with us the Land Acknowledgement that we read aloud at the beginning of the day. Thank you to Spielman Bagels in Multnomah Village, Einstein Bagels in Hillsdale, Starbucks in Sellwood, Starbucks in Hillsdale, Grand Central Bakery in Beaverton, and Grand Central Bakery in Sellwood, for fueling this good work with in-kind donations! We’ve uploaded some photos here, but there are even more on our Facebook album – click HERE! 155 amazing volunteers helped make this -the 10th Annual- our biggest-ever Watershed Wide Event! Not everyone’s here, some folks met us on-site. Planting together – good for the soul!